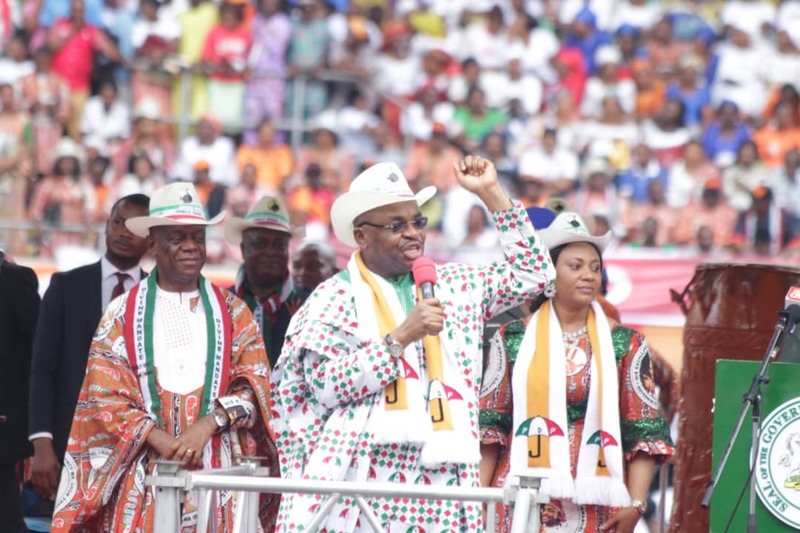 Lagos – Udom Emmanuel, the Akwa-Ibom State governor, has raised the alarm over threats by troublemakers to disrupt the 2019 governorship election in the state. Governor Emmanuel said they were already sewing fake army and police uniforms while also bringing in different ammunitions through the riverine areas of the state. In an interview with journalists at the weekend, Emmanuel said he would not be distracted but focus on his industrialisation drive in the state. He said he would continue to preach peace which had been the trademark of the state since his administration came in over three years ago. The governor, who is the Peoples Democratic Party (PDP) candidate for the governorship election in the state, also lamented the fact that those threatening to invade the state and take it over like Hitler took over Poland had moved their children abroad, saying it was unthinkable that people who said they were seeking elective positions to serve the people would be talking of waging war against them at the same time. He said: “Those who are calling for Warsaw saw war knows that it either they have war in their homes or war in their pockets. On our part, we say peace begets peace. That is what we preach. Jesus Christ said, ‘my peace I give unto you, not as the world giveth’. So, our own is to preach peace, their own is to preach war. “But I just want to let Nigerians know that the same people who are preaching Warsaw saw war, hoping to see war, ask them where are their children? Who are these children that you want to put before war when you’ve gone to hide your own somewhere? Were these children not given birth to by fellow Nigerians like you? Unfortunately, that is the disadvantages of freedom of speech and human rights because people just say things. “So, we don’t have Warsaw here. We have Akwa-Ibom state. It is the only state named after God and God is the Prince of Peace. That is why we believe that all those plans will be disappointed and frustrated, but in real terms, they are actually preparing, but whether that will succeed or not depends on God. However, in his reaction, Senator Godswill Akpabio, a chieftain of the All Progressives Congress (APC), who made the Warsaw saw war statement, said the PDP was raising a lot of security issues in the state while putting the blame on the opposition. 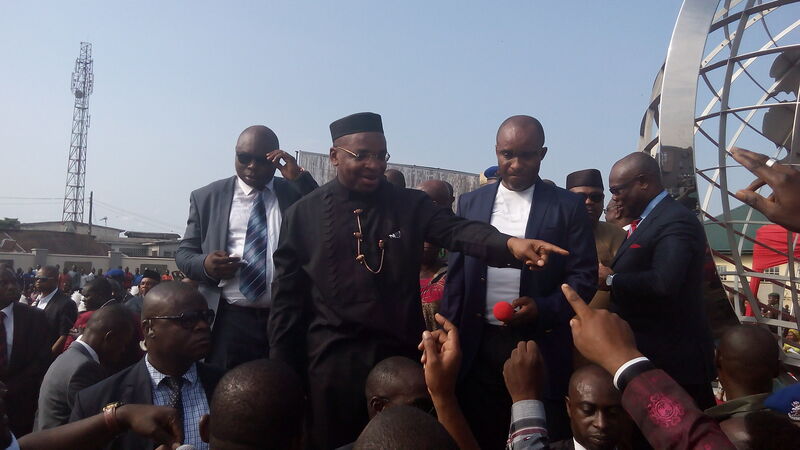 Speaking on the claim by Senator Bassey Akpan, lawmaker representing Akwa Ibom North East, that a plot was being hatched by the leadership of the APC in Akwa Ibom State to cause mayhem in the state during the gubernatorial election slated for Saturday, March 2, 2019, Akpabio said the APC would become the ruling party in the state and described the PDP as the aggressor trying to play the role of the victim. Akpabio’s words: “What is happening here is the situation of the aggressor trying to play the role of a victim. Since my defection to APC, Akwa Ibom people have moved in their thousands into the APC. “It is actually the PDP that is causing a lot of security issues in the state. A lot of people have resigned from this government to join APC. A day after I joined the APC, over eight miscreants came to the front of my house and shot bullets into my compound. And when I asked, they said they are armed robbers. Then in Nsima Ekere’s house, while people were jubilating, bullet penetrated his roof, through the POP and enters his bedroom. “The Commissioner of Police in Akwa Ibom State and the Director of DSS examined the place. It was worrisome to know that that bullet was fired directly from on top of the roof to assassinate the governorship candidate of the APC. One of my Senior Assistants wrote a critical article against the Akwa Ibom government; if you see bullet in his house, he had to hide under the bed.